FanDuel finally adopted fantasy golf to their platform in 2016 due to the rising popularity of the sport in the fantasy sports industry. It has since become one of the top played sports on FanDuel.com. So to answer the most asked question over the past few years, "Does Fanduel Have Golf" - Yes they do. This walkthrough will teach you the fundamentals of FanDuel's Fantasy Golf product and teach you some basic strategies to play for real money and profit. You can also check out their official training guide here: FanDuel Fantasy Golf Guide. If you have played fantasy golf at any of the other daily sites then you will be familiar with FanDuel's version because it is now exactly the same with the exception of scoring rules. Once you enter a golf contest you simple have to draft a team of 6 golfers per tournament. The contest is setup using salary cap rules, meaning you start with a cap of $60,000 and try to draft your team to fit under that cap. Each player is assigned a a dollar amount and as you draft them you will see your total salary cap dollars drop. The goal is to draft the best team of golfers that can possibly fit under the $60K total allotted. For example, a player like Dustin Johnson is going to be highly priced around $11,000 for any given tournament. If you choose to draft him to your fantasy team you will now have $49,000 left to draft 5 other players with. The top players in the world are usually around the $10K mark, the middle tier around $7500 to $9000 and everyone else $7K and below. The purpose of each golf contest is to score more points then your opponents obviously, so the next step is go over FanDuel's golf scoring system. 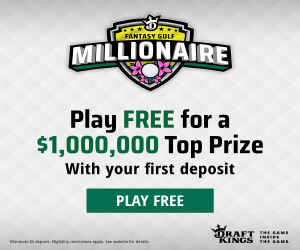 Almost everything your golfer does on each hole will affect your point total in some way, which makes watching golf so much more intriguing now that we have daily fantasy golf to keep us entertained all tournament long. You can score points in a few different ways on FanDuel - Per Hole Scoring, Overall Standings Score and Bonus/Streak Scoring. Let's break down each below. These points are given out based on the overall standings of the golf tournament. They will be automatically reflected in your point total as the tournament is ongoing live. If there are ties each player will still receive the full amount of points. A cool little twist to daily fantasy golf is the bonus streaks which just adds to overall excitement of the contest. FanDuel has their own unique bonus scoring which can change your strategy on who to draft each tournament. Add all these points up at the end of each 4 day PGA tournament and that's how winners are declared in FanDuel Fantasy Golf. Just Make The Cut - when you are starting out don't try and pick the winner of each tournament, it's so hard to predict that. Aim to go 6 for 6 in your golfers making the cut, that's much more manageable. Even 5 for 6 and you will still got a shot at cash prizes but if you lose two or more players to the cut line it's all but over for your team. Course History - one the simplest fantasy golf tips is to look at past course history to predict the future. Many players have courses they play better on or their golf game is just suited better for. A player that has had consistent performance on a course is a safe play and you should draft him. 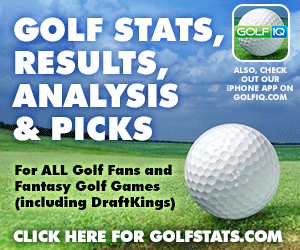 We give out course history picks every week on our ​Fantasy Golf Picks Articles. Recent Form - golf is a very finicky game. One week you are top 5, the next you are missing the cut. The highs and lows in a golf season can be so dramatic from month to month and for whatever reason a player can go on long cold streaks. Look for someone who has strung together 2 or 3 great tournaments with top 25 finishes or better, they likely are feeling pretty good about their swings and confidence is high. There are so many tools and lineup optimizers flooding the DFS market right now it is impossible to keep up. We have tried a bunch out and quite honestly there is no perfect system out there. If you think using a golf lineup optimizer is going to guarantee wins every night, you are sadly mistaken. 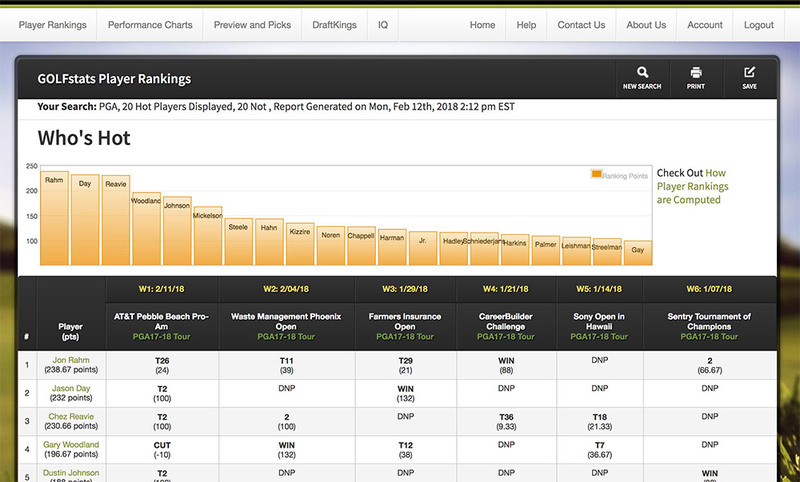 That being said, using a fantasy golf tool can be invaluable and keep you ahead of the competition in the long run. This site has so much information and their collection of golf stats it truly incredible. All our course history picks come from them as they have a database that has captured every single tournament result dating back as far as the 1970's. It's basically a historical golf stats site that has been transformed into an awesome weekly fantasy golf tool. They have tons of free content as well every week for each and every tournament. And you will receive $5 off either their 6 month or full year subscription.